Hooda was to address the poll rally in favour of Congress nominee Randeep Singh Surjewala in Jind. CHANDIGARH: As the CBI carried out searches at former Haryana chief minister Bhupinder Singh Hooda's Rohtak residence, Congress MLA Kuldeep Sharma lambasted the BJP government and charged that the action was intended to stop the senior Congress leader from attending a poll rally to be held Friday in the run-up to the Jind bypoll. Jind bypoll, which has turned out to be a multi-cornered contest, will take place on January 28. "The Jind by-election is going to take place and today, a poll rally was organised. It (CBI raid) was to happen and it was carried out with an intention of political ill will in order to influence the by-election," Sharma said while talking to reporters in Rohtak. "The BJP government got this despicable act done in order to stop Hooda from going to the rally," alleged Sharma, who is MLA from Ganaur. The former Haryana chief minister, along with other senior leaders, has been campaigning for Surjewala for the crucial Jind bypoll. 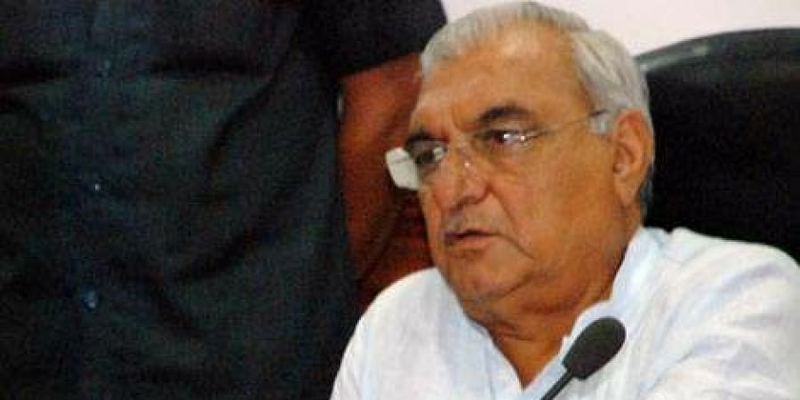 A CBI team from Delhi Friday raided Hooda's house in Rohtak and other places in a land allocation irregularities case, officials said. The Central Bureau of Investigation is carrying out searches at 30 other locations in Delhi-NCR, they said. The former Haryana chief minister, along with his son and MP Deepinder Singh Hooda, was also present in the house. The Congress has fielded Jat leader and All India Congress Committee communication in-charge Randeep Singh Surjewala, a sitting legislator from Kaithal, while the ruling party BJP has nominated Krishan Middha, son of INLD legislator Hari Chand Middha, whose death necessitated the bypoll. The Indian National Lok Dal has fielded local Jat leader Umedh Singh Redhu, while the newly-floated Jannayak Janta Party, a breakaway party from the Chautala family-led INLD, nominated political greenhorn Digvijay Singh Chautala.